As I was reading a few online pieces on Apple’s victory over Samsung in one of the multiple patent battles confronting them (btw, you can check out this interesting interview with Richard Posner, as well as this piece on how jury deliberations took place) I came accross an article that blames not the proliferation of trivial patents but “suit-and-tie lawyers” for stiffling creativity and innovation. Before continuing with the suit talk, a quick remark on the proliferation of patent suits and on the accusation about lawyers’ destructing creativity. I agree that some degree of oddness may be inevitable when competition and the battle for innovation moves from the markets to the courts. And even though in some (many) cases such a move may also be inevitable (which not only is natural, but also convenient because otherwise most of us would be unemployed), the level of litigation that is taking place in relation to the smartphone industry is simply nuts. Posner has a point (there’s definately something wrong with the system that feeds “trolls” or that forces a company is forced to buy another just to acquire its patents to avoid future suits). Given the enormous cash reserves that these companies have ($110 billion in the case of Apple), legal fees and expenses derived from multiple and expensive parallell lawsuts are not a major concern, much less when these suits often pay-off (it’s hard to speak of sham litigation in this setting) and even have the potential to significantly alter the market. Patent lawyers are benefitting from this, but is it their fault? Nope, what happens is that companies are rationally exploiting the opportunities that an arguably ill-designed legal regime offers them. And speaking about system design, I admit that I also have issues with the fact that the outcome of cases like this one depends on the decision that 9 jurors take over highly technical matters. [I said above that patent lawyers are doing well. Want to know the estimated legal fees of Morrison&Foerster, Wilmer (both representing Apple) and Quinn Emanuel (Samsung) for this case? You do, uh? 😉 Check here then (for the lazy ones: the range goes from $10 million to several hundred million dollars per party…). Now back to the other suits (I bet Apple and Samsung’s lawyers will be buying some pretty expensive ones in preparation for the appeal). My saturday-morning Google search on “suit-and-tie lawyers” [btw, Google is searching for an in-house competition lawyer] made me realize how candent this issue is. The suit has traditionally been lawyers’ uniform (I’m sure you’ve heard about “power suits”; see here) but it is a fact that lawyers are “dressing down” these days (although some say the contrary). I, for one, typically feel like a living old-school reminiscence when I meet friends working for US firms and I’m the sole one wearing a tie (at my firm we’ve so far only managed to make inroads into casual Fridays and casual August…). There are many pieces that pose the question of whether we should start dressing differently (see, e.g. here). The proliferation of such questions have spurred vehement reactions from those who claim that “Enough is enough, lawyers should look like lawyers!” . Does this look like a trivial issue to you? In some places it apparently isn’t. Just a few days ago, a lawyer from Pakistan wrote a piece in the Herald Tribune advocating for the abandonment of western-suits with the argument that “if we are able to achieve that (at least with our lawyers’ uniform) then we can be at the threshold of reconstructing a new, more culturally connected and logically sound society. This change can lead to a domino effect that results in the recapturing of other areas of society and public discourse that are being dominated by the colonial mindset“. No less! Btw, if you want to know which is the world’s smartest law firm, click here. 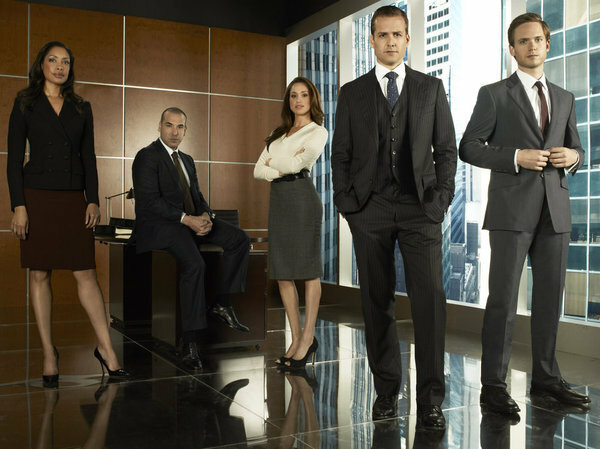 In our post about legal movies and TV series we forgot to mention the much acclaimed Suits. I watched the pilot last night (what better to disconnet from a working weekend than to watch a series about a law firm, right?) and I can confirm that it’s pretty good. P.S. This post was brought to you by Suit Supply. « The Saturday Morning Slot? I urge everyone to watch Suits. I’m not sure to what extent it’s a very accurate portrayal of the life of a US corporate lawyer in his late thirties but the quality of the dialogues will make you want to pause and rewind to memorize them and hope to be able to use them in real life. The main character is either the man you want to be or the man you want to be with.